This Saturday, I embark upon a historic milestone: my tenth marathon. "Damn, you need to branch out more," you say? 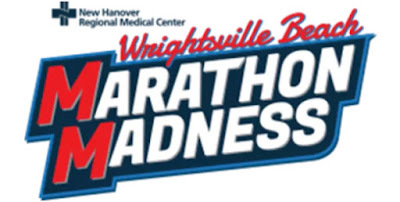 Your wish is my command: I'm heading down to NC for the Wrightsville Beach Marathon. I hear the course is flat and fast, and my dad can drive me to the start line, which is another perk I look for in a race. Some interesting (and dare I say heartening?) coincidences here. The weather forecast for Wrightsville Beach calls for a high of 66, which sounds lovely. Except the race starts before 7am, and when I look at the hourly I'll probably be starting with temps in the upper 40s and maaaaybe finish in the low low 60s if I'm very lucky. I'm a warm weather girl, but these temperatures aren't too far off from what I experienced during my last WDW Marathon... when I PR'd HARD. Also? My bib number is exactly the same as it was for last year's Parks Half Marathon... in which I PR'd for the half. So. My IT Band has been behaving lately. I felt strong and capable during my 17 miler. I have good omens on my side. Am I looking at a really great race?! Probably not, now that I've suggested it. Dammit, why did I have to take up blogging? Oh well. Wish me luck!